One student advances research in Marine Chemistry and embarks on a bright future plus highlights from several successful Summer Research Programs. Marine biology first showed signs as a field of study in 1200 BC when the Phoenicians used the stars to track their ocean voyages. A more definitive recording of the science didn’t happen until around 380 BC in Greece when Aristotle, known as the father of marine biology, identified a variety of species. 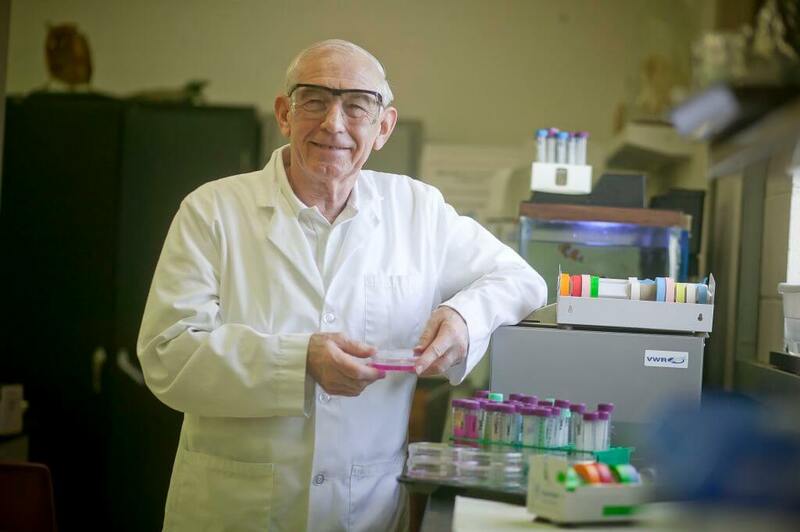 Fast forward over 2,000 years and nearly 5,000 miles west on the campus of Monmouth University, and one marine chemist in particular is still searching, quietly, for answers in our waterways. Considering oceans cover about 71 percent of the Earth’s surface, his findings could have a profound impact. Pete Chace, a 2012 Summer Research Program participant who attained a bachelor’s degree in biology and chemistry in May 2015, is a standout student who embraces exploration and analysis. From long-term plankton studies in Barnegat Bay to researching in Seattle for the National Oceanic and Atmospheric Administration’s Earth-Oceans Interactions Group to a presentation in Spain showing the geochemical impacts of shallow volcanic gas vents on coral reefs, the young academic career of this New Jersey native could never be called lackluster. And the tide of Pete’s career is just getting started. Interspersed among his numerous research projects was a five-year stint as a jellyfish curator, interpreter, and relief aquarist at Jenkinson’s Aquarium in Point Pleasant. When asked what scares him, Pete shrugged his shoulders and said, “The sound of running water when it shouldn’t be running.” He recalled having dreams of cracked fish tanks and the resulting trickle or gush of water. Geneviève Fasano completed research on changes in gene expression in rats following inflammation under the supervision of then-School of Science Dean Michael A. Palladino, PhD. 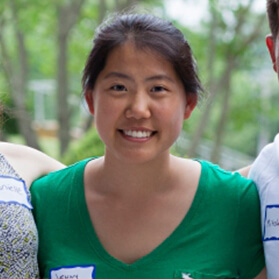 She went on to present her research at the 2014 National Conference on Undergraduate Research (NCUR) at the University of Kentucky in Lexington and the 39th Annual Meeting of the American Society of Andrology (ASA) in Atlanta, GA. Fasano graduated from the Monmouth University Honors School and attends Drexel University College of Medicine. Pete has always wanted to be a scientist. At the age of seven he would frequent the brackish waterways in his hometown of Brick Township and volunteer at nature centers. He discovered his passion for learning more about fish and decided, when he grew up, he would be an ichthyologist …otherwise known as a fish scientist. Armed with a double major in chemistry and marine and environmental biology and policy and a minor in statistics, the 22-year-old had already mapped out the next stage of his life prior to commencement in May 2015. He is returning to the West Coast to study at Oregon State University for a master’s degree in chemical oceanography, a path that will likely lead into a doctoral program. He will study the chemical-biological interfaces of extreme habitats, particularly those of deep-sea vents. This is Pete’s third trip to the West Coast. In the summer of 2013 he interned for 10 weeks at Oregon State as part of a research experience for undergraduates, and in summer 2014 he received a NOAA scholarship and studied the chemistry of hydrothermal vents at the University of Washington in Seattle. When asked about his dream job, Pete said without hesitation that he aspires to be a research professor. 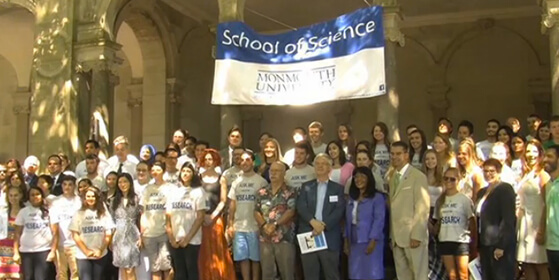 An academic career would enable him to continue his research but also share his knowledge with students—something he has been doing for three years at Monmouth as a Peer Mentor in the School of Science. The Peer Mentoring program is directed by Interim Dean Catherine Duckett and Dr. Kucharczyk. Mentors meet with first-year students periodically throughout the semester, both individually and in group activities. They answer questions about life at MU and how to obtain academic assistance and other help on campus. They also encourage critical thinking that will enable students to solve their own problems. As evidenced by his many fans, Pete has taken full advantage of every opportunity offered at the School of Science. When he wasn’t studying, researching, or mentoring, Pete spent some time working with Dr. Tsanangurayi Tongesayi on developing environmental remediation technologies. He has also provided field support for Dr. Ursula Howson’s long-term plankton studies. Professor James P. Mack of the Biology Department is a faculty mentor, working with students to explore new solutions to every day problems. 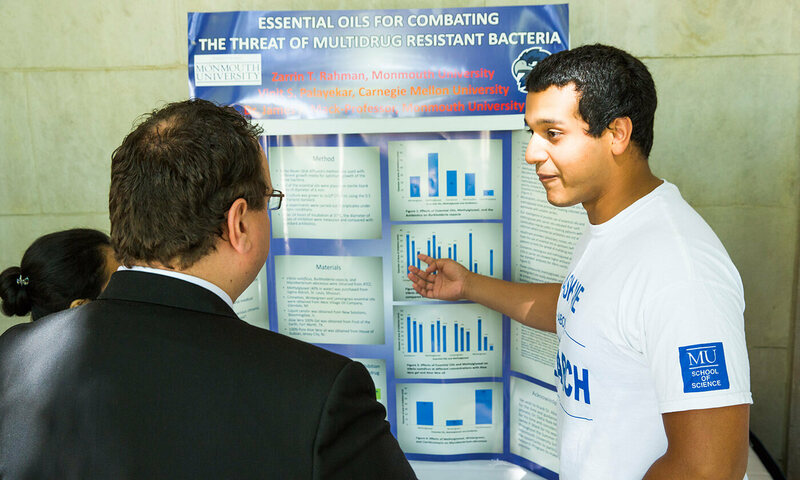 Professor Mack and Wardha K. Qureshi tested the use of common essential oils against treatment resistant bacteria. She presented a poster on the topic at the National Conference on Undergraduate Research (NCUR) 2014.